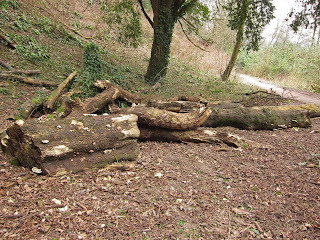 by a river where there are a lot of fallen and felled trees. In these pictures, they are yew and sycamore. I won't pretend to know anything about them, just put them here for you to see - though if anyone would like to suggest what they are - that WOULD be interesting! It's forever striking me how interest shifts as one gets closer to things. It's almost as if they become something else completely. A few years ago, I decided there was no reason why I shouldn't name fungi in my own way - devise new names. That way, I wouldn't run the risk of misleading anyone, of saying things are what they are not - and I named one after pasta shells. As part of the Blogger setup, you can see what words people have typed into a search engine to land up here, on Loose and Leafy. It's surprising how often people are looking for 'Fungi which look like pasta'! This one, I now name 'Mutton Pie'. Though when you look at its underside . 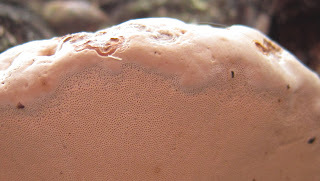 . .
Part of the underside of 'Mutton Pie' fungus. 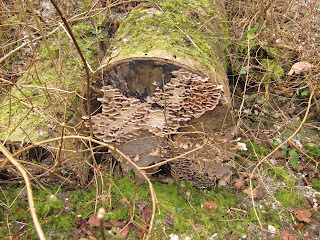 There were quite a few like this (about six inches across) on the logs in the picture above. I don't like them much - though they are interesting. The top-side texture is strange. 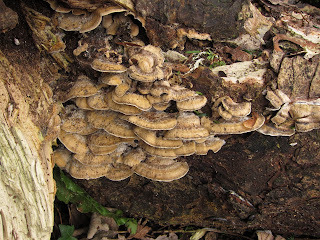 (They were growing flush with the bark so I couldn't see their underneaths.) They seem to have dragons' scales growing through them. Further along the track, growing from the remains of a tree which still has its roots in the ground was this. These are quite big. I call them 'Uplighters'. The Mutton Pies were growing on wood which was beginning to flake away. So was the one with dinosaur's scales. The Uplighters are on a tree that still has life in its roots, with what seem to be suckers growing out from them. 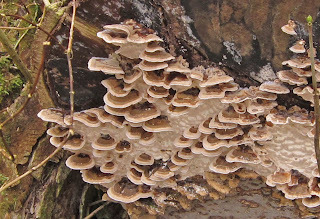 The fungi below are growing on wood that has been left in place long enough after felling for moss to grow over the bark - but they are not flaking away and keep their shape. This is what they look like close to. I haven't got a name for them yet. Have you? This is the elderberry tree I am following. When I set out to take the picture, there was sunshine. evening fell and the light failed. Still - enough was left to see by! Here's an update on other people who are 'following' trees. - click HERE for her first tree-following post. - a magnificent plane at Compton Verney in Warwickshire. will be following this year at On the Edge Gardening. - Lime (Tilia x europaea) and Copper Beech (Fagus sylvatica “Atropurpurea”). Her second post is now up The Eyes Have It! Hyde Daily Photo - The Tree Un-named - Two Posts . . .
- he introduces it in a post called 'Hedging My Bets'. and I'll put an updated link to it here.
. . . let me know! I like your idea of renaming the fungi that you find. They are all interesting in different ways aren't they? Thanks for adding me to the role of tree-follow honour. Great fungi pics, especially the pale green one. Your photos of fungi are amazing. 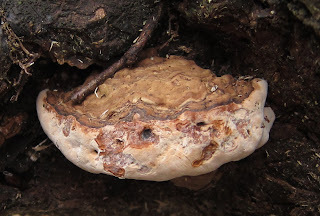 I will definitely be looking at fungi more closely in future! Your unnamed fungi remind me of mountain perches. Thanks for adding me too to your tree followers, hope to post about my tree tomorrow. Hello Toffeeapple. Fungi are such strange things they never seem quite to 'belong' - yet they are fundamental to so much . . . possibly everything! Hello Wildgardener. Pleased to have you and your ash aboard!
. . . and you too, Sarah. Looking forward to reading your tree post. mutton pie fungus - well they'll have gotten their original names in a similar manner with folk thinking what they reminded themselves of - I was looking at an old nearby oak recently with a broken branch and have now just discovered a 2009 photo I took with the branch intact - don't know when I'll blog about it yet though. Hi, Gerald. If you post a comparison of what the oak was like 'then' and what it's like now - do make sure I know and I'll put a link to it from here. Interesting post! Fungi is rarely featured on garden blogs yet is very much part of its balance. So many interesting ones out there, with even more interesting appearances! 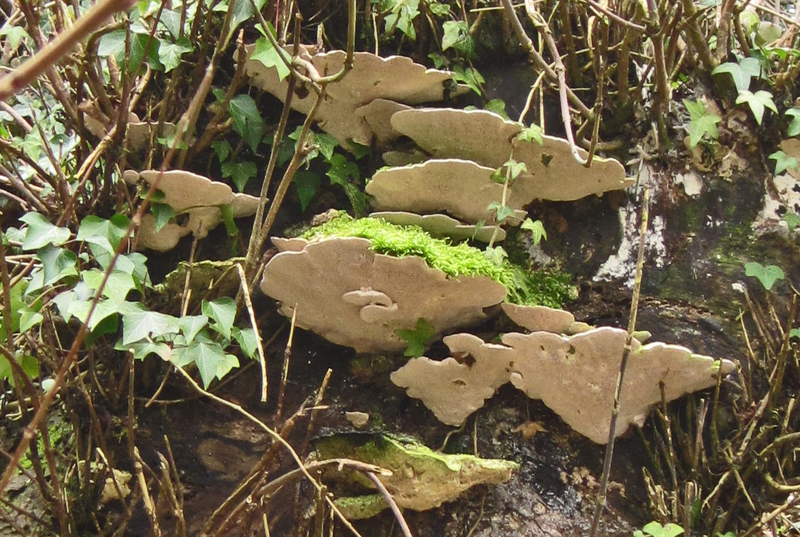 Love the fungi pictures - they are fascinating, aren't they? 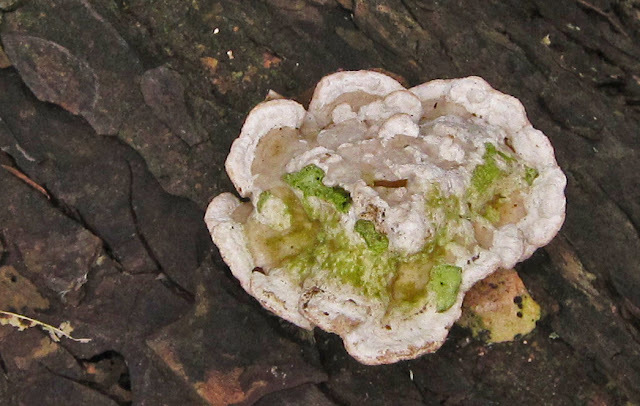 It's amazing how much fungus there is around once you start to look. The old post that you mentioned in your comment on my blog - it does look like Jew's Ear to me. For the unnamed fungi, how about Turkey Tails? 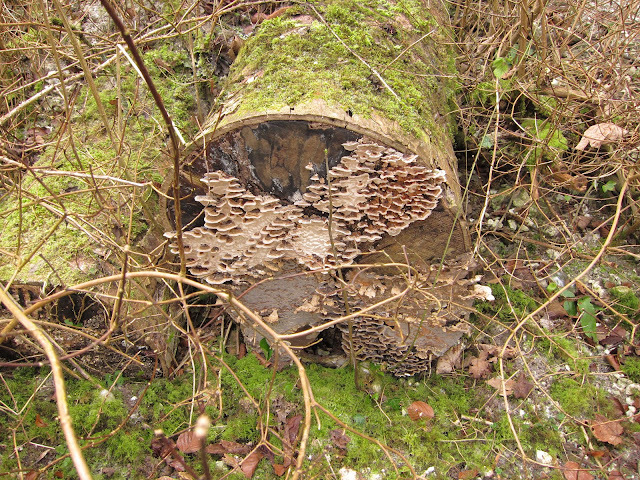 I Love FUNGI! It is perhaps the most vital species on the planet. Paul Stamets is a great and fascinating authority on fungi. He has a great book called "Mycelium Running". A recommended read for anyone who is fascinated by the way nature does what it does. Fungi are the best! I've always loved them. 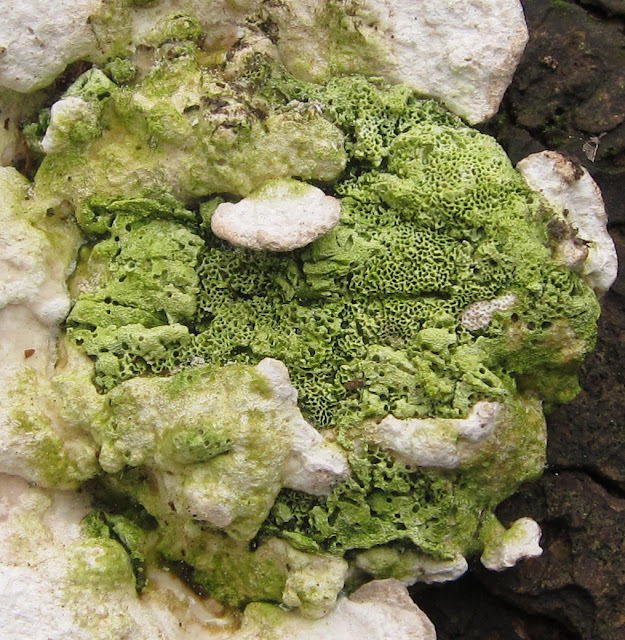 I get some kind of cool fungi growths on two tree stumps in my backyard--I have no idea why I've never thought to photograph them, as I very much appreciate them IRL. Well, that's a project for this year, then. Beautiful collection of fungi. So many types. Wow, you have an eye for unusual. Nic post. Lucy, what amazing posts! Thank you for your message on my blog, Wild and Wonderful. I'm actually living in a temp. flat surrounded by concrete at present, so no trees to hand in terms of 'watching' one. When we move (which we hope to do soon) I may get back in touch with regard to your follow-on project from TTY. Meanwhile, I'll add you to my blogroll. Thank you! 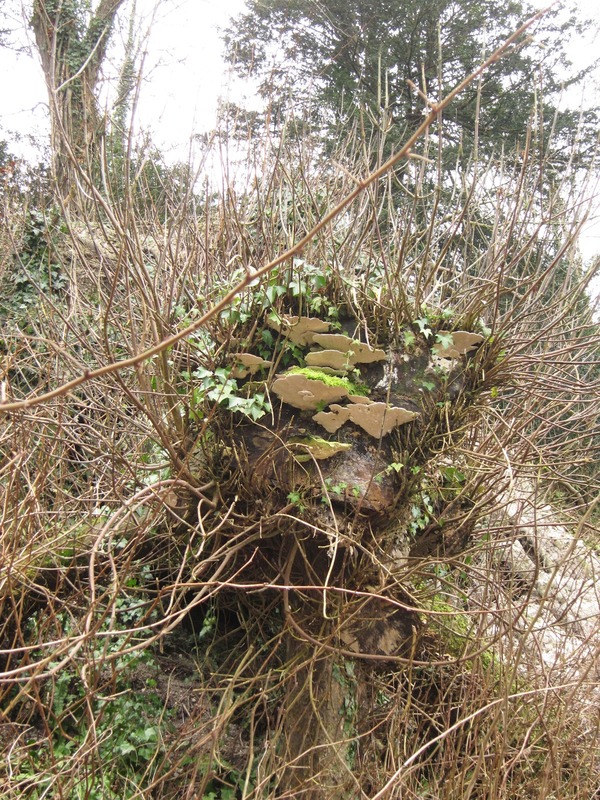 I really enjoyed this post with the fungi and following a tree Lucy. I visited a few days ago, but as you know I have a hard time with the captcha. Thanks for stopping by my blog and giving me feedback. I'm always looking for ways to make my blog more user friendly.